On May 18, 2015 at 7PM fifth graders from different schools went to dance the Merengue, Waltz, Swing, Tango, and Salsa at the CRLS gym. From the FMA school 23 students, dressed in red sashes, attended. Teachers from the FMA and other schools also attended. The students from other school were there to dance just like the FMA students. They did these dances to entertain friends and family of the dancers. They did this to show what they had learned in gym during the weeks of ballroom dancing. They also did this to show their dancing skills. All the people that work for the school department, like the superintendent, deputy superintendent, and the two assistant superintendents, made this event take place. Also the school committee members might have helped. The dancers (the students) got to watch MIT dancers perform a couple of dances. It was entertaining and made you want to go up and do the dances with them. In the end, Steve and Amarah from the FMA each won a trophy for dancing the Merengue. Other students from other schools also won. From each school one couple won. Even though kids were nervous in the beginning the show was exciting to watch and people enjoyed it!. The dancers from the FMA were Laila, Amarah, Karla, Carissa, Alba, Lailah, Jaylene, Angelyna, Jeanny, Tianna, Brandy, Kayla, Keyah, Harmone, Anayllah, Crave, Isaiah, Steve, Collin, Jadon, Jameer, Antonio, and Jahmari. 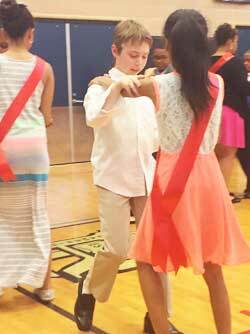 During May 18 2015 at 7PM at the CRLS high school fifth graders in the CPS program had a ballroom dancing performance. Today we have an in depth look at the FMA students. “We had a great time watching MIT students dance”, says Crave Milord, age 11. “Jameer’s baby brother slapped me!” Says Jamari Griffin. “I never knew Jamari had this in him!” says Jamari’s mother. It seems that these fifth graders had a good time. Now we take it to some other students saying, “It was the time of my life” says fifth grade teacher, Ms. Brennan. “I got to see mini “Jameer!” Here we have interviewed PE teacher, coach Evan, “I knew they could do it. We had a great time that fine night”.